The Big White House provides four star self catering sole use accommodation for large groups of up to 24 people. The detached house is located in the village of Greengill outside of Cockermouth in the Lake District, Cumbria. 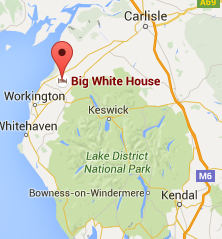 The Big White House is ideal for family holidays, reunions, get-togethers and corporate events. We do not accept stag or hen parties at this time. Short breaks are available all year around as well as full weeks. Find out more about our fantastic Lake District Group Accommodation.